Description 6 Great Experiences in 1 Great Tour! This is the most beautiful, historical and visually intoxicating experience you will ever have! Visit the incredible 900 year old Joshua Tree Forest, Eagle Point, Guano Point (approx. 4 hours to explore the most beautiful natural locations at the rim of the Grand Canyon). Have a romantic picnic lunch at the rim, stroll the boardwalk of the Hualapai Ranch & Western Town and see Native American Dancing and Dwellings. We also include a wonderful photo stop and oratory at Hoover Dam. This incredible tour includes all the highlights of the “5 in 1 Tour” plus you will soar like an Eagle on a breathtaking flight over the rim to the bottom of the Grand Canyon in one of our fabulous EC 130 Jet Helicopters. While on the floor of the canyon you have time to explore and take photos at this amazing location and then you’ll fly another stunningly beautiful route 4000 feet up, returning to the rim viewpoints. This, without a doubt, will be “the most exciting family outing” of your life! Total time at the Grand Canyon including flight, approx 4 hours. 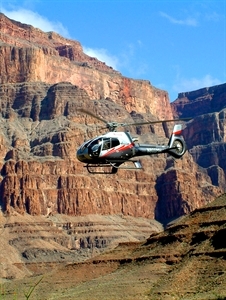 This Grand Canyon tour is, without a doubt, "the most exciting family outing" of a lifetime! Total time at the Grand Canyon including the flight, approximately four hours. The tour includes a continental breakfast, lunch, unlimited bottled water and snacks. Transportation by luxury 7-passenger SUV's or custom 14-passenger VIP mini-coaches. This tour operates daily from 7:00 a.m. to approximately 5:30 p.m. Hours Monday-Sunday 7:00 a.m. to 6:59 a.m.
Add Grand Canyon West 6-in-1 Ground and Helicopter Tour to your free online travel itinerary.